#WhiteRabbitEjuice - WhiteRabbitEjuice offers 9 amazing flavor in 0,3 & 6MG. All 9 flavors are truly amazing! How deep down the rabbit hole are you willing to go? How far down the rabbit hole are you willing to go? A warm deep-fried glazed doughnut sandwich with creamy vanilla bean ice cream and sweet blueberry drizzle on top. Straight out of the oven, a delicious lemon sugar cookie. Warm Apple Pie drizzled with Salted Caramel and Apple Candy, served with melted Vanilla Bean Ice-Cream on the side. Let me take you down, cause I’m going to Frozen Strawberry Fields. A Fresh mix of strawberry fields with a frozen punch and hints of mint, perfectly balanced. A Frozen Apple that will blow your mind, feels like an apple got locked inside a minty ice cube. Chill with a frozen cold Mint Lemonade with unexpected twist. #Keepit100proof - Packaging 10 out of 10 flavors flavors 10 out of 10, the only reason it's not first place is because it's 30ml vs the 40ml that took the first place. After all, who ever wants to run out of e-liquid? We have heard from customers that going a day without Sour Nectar seems ridiculous, as the sour appeal of strawberry, kiwi, and a hint of peach during the exhale keeps customers coming back for a tropical starburst candy taste. For any of our southern customers, the Southern Brew vape juice combines the salivating approach of creamy almond milk taste during inhale and a touch of vanilla upon exhale for a very relaxing vapor experience. Last, but certainly not least, 100 Proof's Hawaiian Sun combines a strong guava inhale and results in a vapory watermelon and pineapple treasure during cloud creation. Keep it 100 Proof or go home... or give these savory ejuice flavors a try! Also, don't forget to try Blueberry Shine and Peaches 'N Cream! #adamBomb - Adam Bomb eJuice has few amazing flavors but our top pick for Adam Bomb is the Adam Bomb Chillaxin a very strong cool mint flavor that will wake you up with a bang! Our second favorite by Adam Bomb is Adam Bomb Mama's Cookies a fresh baked cookies flavor delicious! #ItsokaytobeMellow - Bubbles Gum Mellow Yellow is one of our favorites. In a 60ml bottle, you will get the orange flavored bubble gum flavor from what tastes like the sweetest oranges you have ever bit into. Buy some Mellow Yellow today and try to sit patiently until your package arrives before you sink into the mouth watering orange juice flavors as you exhale into orange bubble gum bliss. Equally impressive is the Crimson Sweet as a sugary watermelon bubblegum infusion of flavor. #CaseoftheMondays - In this case, Mondays are a good thing. With four premium e-liquids known as Breakfast Donut, French Toast, Milk & Oats, and Fruit Flakes, you'll be happily salivating for a morning cloud-based commute at the start of every week. Our personal favorites are Breakfast Donut and French Toast, but do not worry about the calories for this breakfast, you will be too nostalgic with the sweet taste of an early morning vapor snack ready for the go. #itsTimeforREUP Jolly Green enables a sour green apple adventure that will leave you coming back for more, and Red Delight offers a tangy strawberry sour straw reminiscent of those candy purchases enjoyable during a new release at the theater. Both eliquids are formidable e-juice opponents for the top spots on our list. We recommend you try both the next time you want to REUP! #ArnoldPalmerPlease - Aesop comes into 2017 strong with its first introduction to the collection with Aesop Strawberry Palmer, an intricate mix of strawberry, lemonade, and ice tea blended and named after the former star golfer, Arnold Palmer. This liquid is available in a 30ml glass bottle and a screw top lid. Order your first of many bottles, and the next time you golfing with friends, you will be sure to score a hole in one with this flavor filled cloud producer! Additionally, try Aesop's Fig & Leaf! #GrabyourKomb - Topping off our list for 2017 is Komb's e-liquid. Only available in a 30ml bottle, this liquid offers a supreme mixture of creme brulee, lemon, and honey to coat your otherwise boring taste buds in a sultry mix of flavors meant to remind you of a honey drizzled French creme brulee meant for only the most refined of palates. The lemon zest that finishes each exhale resets the tone for the next welcoming inhale. 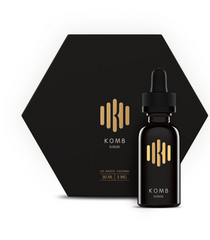 Buy some Komb today and get in touch with an international desert!